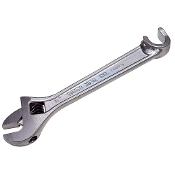 6" ADJUSTABLE WRENCH 8" ADJUSTABLE WRENCH CS UNITEC Ex501-10A, Wrench, Adjustable Non-spark. 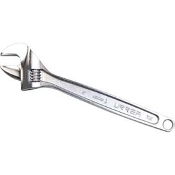 CS UNITEC Ex501-10A, Wrench, Adjustable Non-spark. 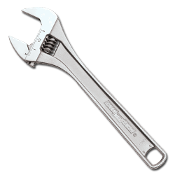 CS UNITEC Ex501-12A, Wrench, Adjustable Non-spark 12"
Urrea 704 - Adjustable Wrench, 4" Long, 1/2" Max Opening Urrea 706, Adjustable Wrench, 6" Long, 15/16" Max Opening URREA 708 Satin Adjustable Wrench 8"
URREA URR708 Satin Adjustable Wrench 8"
URREA URR712SC Black Oxide Adjustable Spud Wrench 1-1/2"